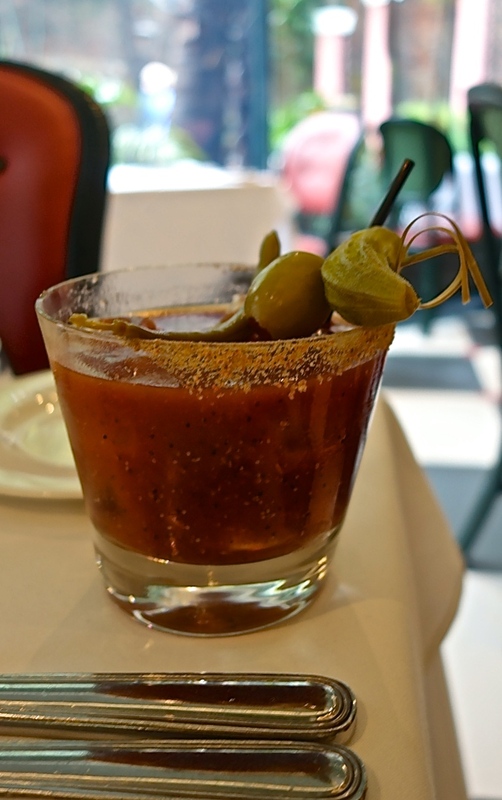 The meal began with a Cajun-spiced Bloody Mary. And it just kept getting better. A rain-free interlude during our mostly water-logged family vacation to New Orleans this spring. Day after day of downpour, triggering memories of those 100% humidity bad hair days that were a fact of life for all us girls who grew up in south Louisiana during the years B.C. (“before Chi”). But we didn’t let the rain stop us from getting to everything we wanted to do on this trip–browsing the shops on Magazine Street, exploring the 19th century Creole mansions that line the edge of the Quarter along Esplanade, even making a side trip to Chalmette during the height of the “monsoon” to take in the museum and soppy grounds at the site of the Battle of New Orleans. And then Friday morning, while the clouds held onto their contents for a few hours, we put away the umbrellas and made our way to Brennan’s, where the food and surroundings seem to make their own sunshine. 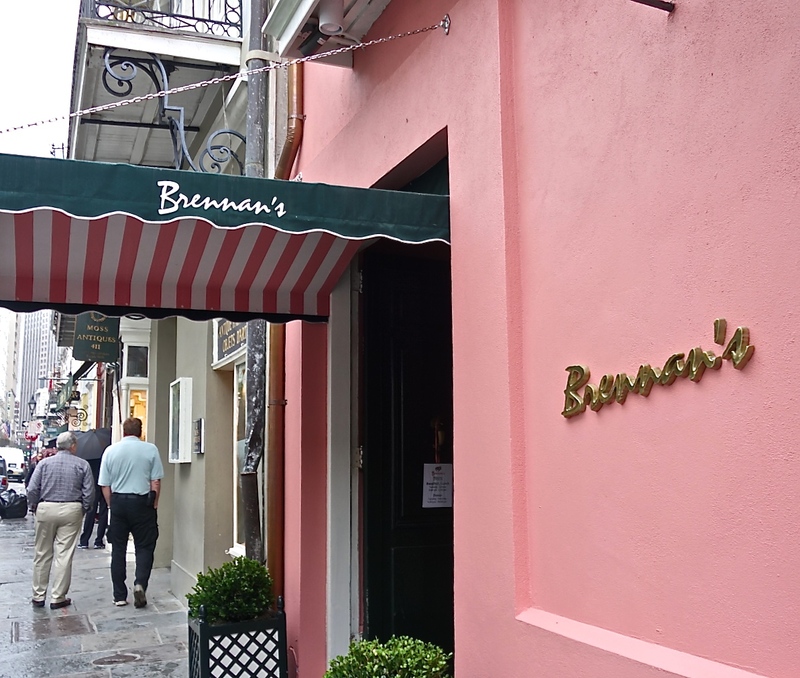 For as long as I can remember, the Brennan family has been a dominant force in the world of upscale New Orleans dining. There are so many family members and restaurants that I have trouble keeping track. Commander’s Palace is the realm of Lally Brennan and Ti Adelaide Martin, the niece and the daughter respectively of renowned Brennan family restaurateur Ella Brennan. For decades, Ella was the driving force behind Commander’s, along with her brother, Dickie Brennan, Sr., who died earlier this year. His son and daughter, Dickie Brennan, Jr. and Lauren Brennan Brower, are part of the group behind Dickie Brennan’s Steakhouse, Bourbon House, the Palace Cafe and Tableau. If any city cherishes its culinary history, it’s New Orleans. Sure, there’s room for the hip and trendy, but you’d better keep in mind what is dear to the hearts of the people who have lived here for generations, because they are not going to be satisfied with anything less. And, what’s more, they don’t mind letting you know when you’re screwing around with a heritage of magnificent eating that dates back three centuries. It all just seems to click at Brennan’s. Rushing has created a menu as bright and cheery as the coral and green walls of the elegant, airy main dining area. His lovingly crafted dishes are grand yet playful, modern yet true to their roots. 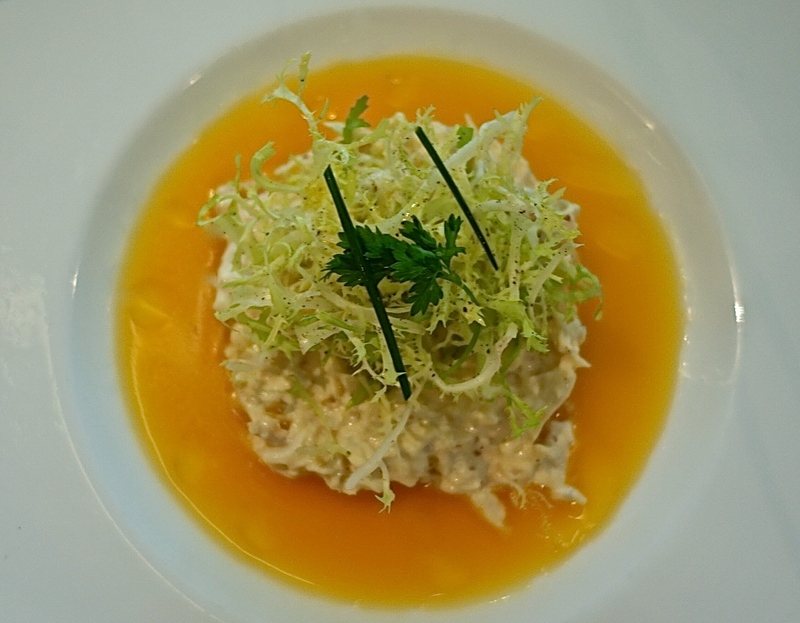 To start, we shared the Crab and celery remoulade in a bright satsuma dressing along with a couple of bowls of Brennan’s file gumbo. The crab dish was simple and fresh, and the gumbo was impeccable. 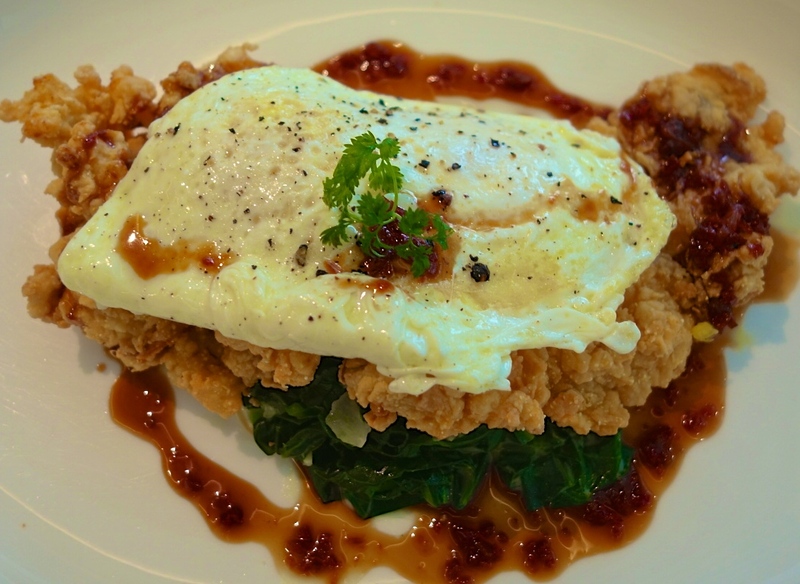 For an entree, I ordered the Rabbit Rushing, a tender chicken fried rabbit filet stacked with creamed collard greens and two eggs, over easy. The creamy sweetness of the egg yolk, the crunch of the rabbit and the zip of the greens and the pickled pork au jus make for a very satisfying combination of flavors and textures. I savored every bite. Equally as good were the Crispy Veal Cheek Grillades with cheddar grits. Like the rabbit dish, all is topped with two over easy eggs. 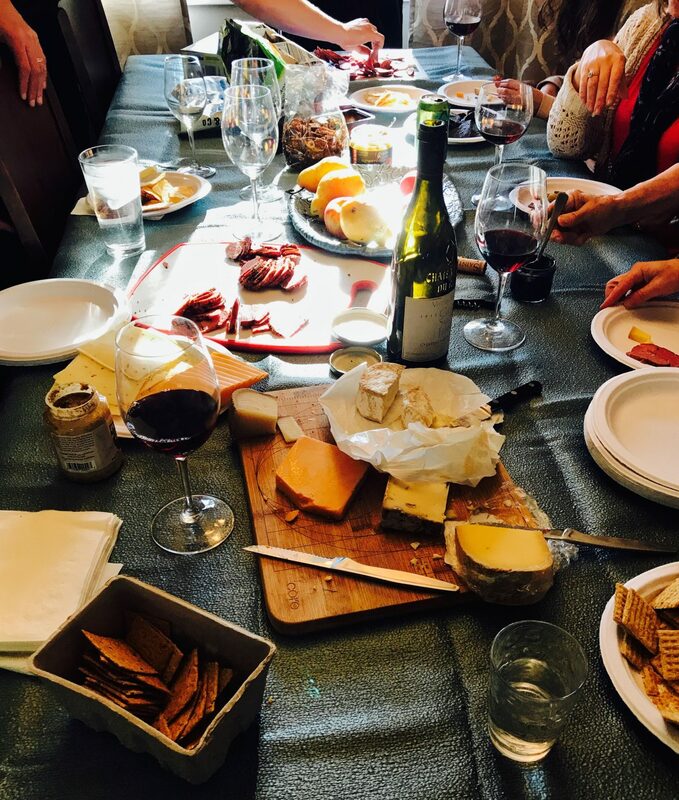 It may seem uncouth to order a dessert after breakfast, but the rules of dining are different when you’re in the city that transformed brunch into decadent and life-changing event. If you’ve never had the Bananas Foster at Brennan’s, then you’ll probably want to do so, just to say you’ve had it at the place that invented it. Look around the dining room, and you’ll find yourself in plentiful company. At any given moment, half the tables are enjoying the dramatic table side preparation of Brennan’s signature dessert–bowls of perfectly scooped ice cream, slender lengthwise slices of banana, mounds of brown sugar and butter at the ready. It’s such a delicious dessert, and the flambé presentation is so theatrical–what’s not to love? But I read a quote from Ella Brennan once, in which she told the story of creating the dish with her cooking staff. She seemed to be saying, in so many words, “What’s all the fuss about?” So if you care to look beyond Bananas Foster, there are other great desserts in the Brennan’s repertoire. 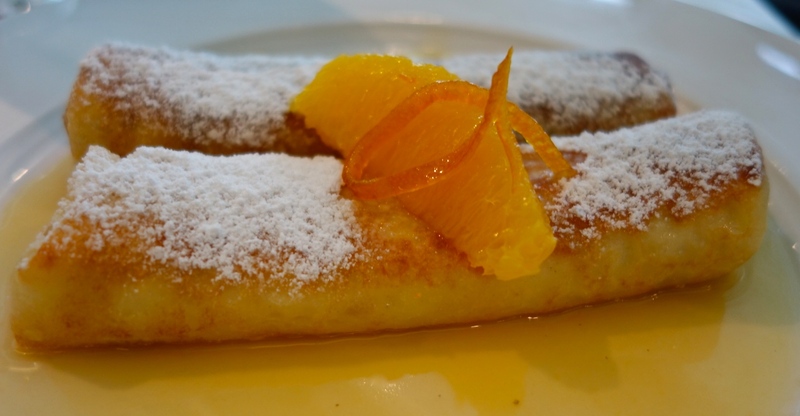 One of them is the Creole Citrus Crepes, filled with a ricotta and cream cheese mixture, dressed up in a sunny lemon & satsuma glaze. For us, they were the perfect end punctuation to a memorable brunch. 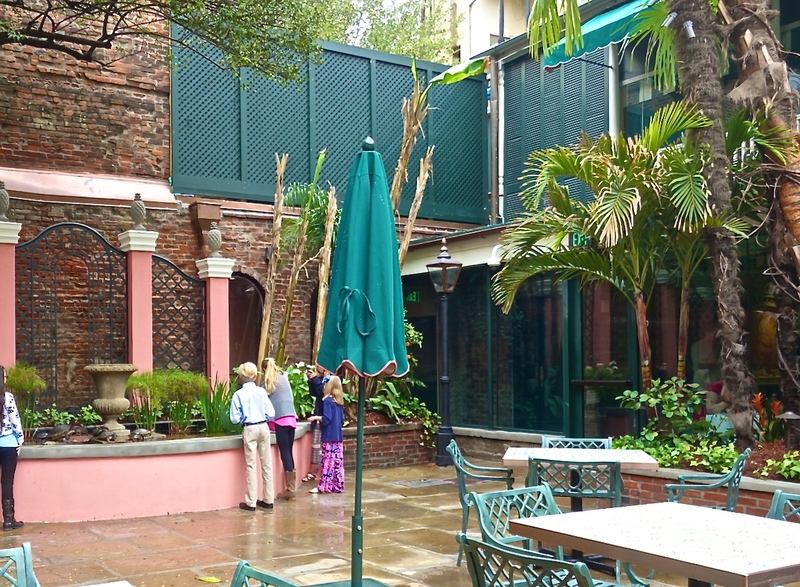 After our last sip of coffee, we walked around in the restaurant’s courtyard, which was too wet to be used that morning for seating patrons. Children were gathered around the famed “courtyard turtles” who live in the restaurant fountain. The turtles had only recently been moved back to the courtyard after the whole renovation and reopening process. Our waiter told us we should come back the next day for the big homecoming event, in which the turtles would be paraded through the Quarter on mini Mardi Gras floats constructed by the restaurant staff. But the next morning, we were on our way back to Houston. 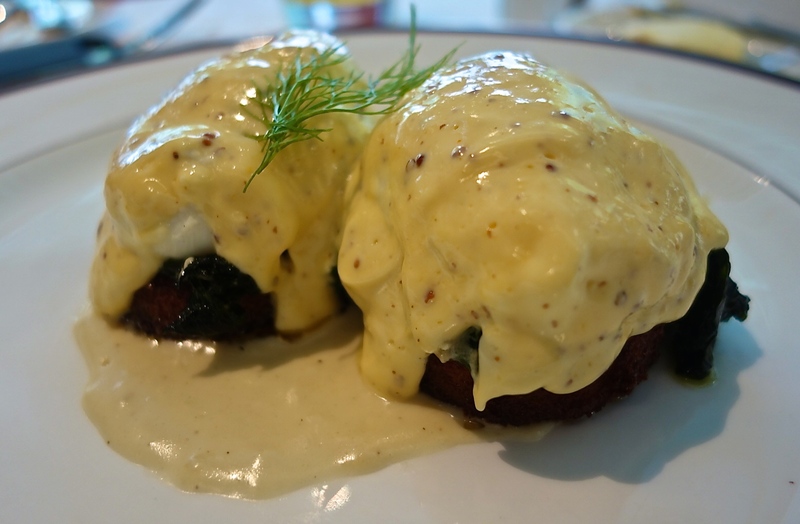 If you’re worried that upscale Creole cuisine is too heavy, too stodgy, too old school for your taste, eat at the new Brennan’s. You’ll never feel happier about having been so wrong about something. Ms. Laura, This is Bryan from Via. I loved this post!!! Keep up the great work!